GUILD AND MANAGEMENT representatives met June 20 to continue collective bargaining for the newsroom. We began by going over a list of things that need to be cleaned up in our existing contract. Some of these items were simple, such as removing obsolete concession and snapback language. Other core items such as pensions and wages required more discussion. After lunch, the COMPANY handed out a proposal encompassing issues that are still on the table. After reviewing the company’s initial proposal, the GUILD drafted a counter proposal, noted below in blue. The COMPANY considered the guild’s proposal and offered their second-round proposal, noted in maroon. COMPANY: Freeze the local pension plan. This means whatever amount you are entitled to today will be all you receive from the local plan when you retire. There would be no additional pension benefits for future years of employment. New employees would have no pension from the local plan. The Company did not propose any changes to The Newspaper Guild International Pension Plan, the much smaller of our two pension plans. GUILD: Reduce the local pension benefit formula by half. Employees would receive the full pension they have earned to now plus one half benefits for years beyond today. COMPANY: No change from initial proposal. COMPANY: The 401(k) plan shall continue to be offered to employees. The company match to the 401(k) is eliminated. The company can change or alter the 401(k) plan. GUILD: Continue the suspension of the 401(k) match. COMPANY: 1) YourHub staff may be assigned to write stories specifically for The Denver Post at the Denver Post reporter wage rate. 2) The Denver Post may publish any YourHub story. 3) Increase YourHub wages by 10 percent. GUILD: 1) The committee agreed that YourHub staff will be allowed to write stories for The Denver Post at Denver Post reporter scale. 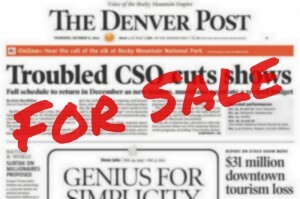 2) The committee agreed with the company proposal to allow The Denver Post to publish YourHub content. The Guild’s counter-proposal is to have new YourHub employees start at the current rate of $562 per week. YourHub staffers with one year of experience would earn $624 per week (10 percent above current scale.) Staffers with three or more years experience would receive $686 per week. 4) YourHub staff should be eligible for severance in the event the YourHub publications are discontinued. COMPANY: The company noted a tentative agreement to the first two points, offered no change from their initial proposal regarding wages and did not respond to the Guild’s fourth point on severance. COMPANY: Elimination of the Copy Editor, Assistant Copy Desk Chief and Wire Editor positions and creation of the Assistant Editor position to be paid at Classification 17 scale. GUILD: The bargaining committee worked with the company to allow the changes to the former copy desk. COMPANY: The company noted a tentative agreement to the Copy Desk issue. COMPANY: Within 30 days after the date of a new contract, the company will have a preview evaluation with each newsroom employee to explain the performance-appraisal system. Six months later, each employee will be given a full performance appraisal. Thereafter performance appraisals will be done on the employee’s anniversary date of hire. GUILD: Thirty to 60 days after the date of a new contract, the company will have a preview evaluation with each newsroom employee. Six months later, the company will provide each employee with a full performance appraisal. This first round of full appraisals will be completed within two months. Six months after the first full appraisal, each employee will receive a second full appraisal. The second round of full appraisals will be completed within two months. Thereafter full performance appraisals will be completed within two weeks of each employee’s anniversary date of hire. Any changes to the performance appraisal system shall be negotiated between the Company and the Guild. COMPANY: Essentially the same as the Guild’s counter proposal except that there shall only be a preview evaluation and one round of full appraisals before regular appraisals are performed within two weeks of an employee’s anniversary date. COMPANY: In the event of layoffs to reduce the workforce, our current language considering seniority within a job title would be used. However, an additional layer of department would be added. That is, layoffs would be considered by job title within a department rather than by job title across the newsroom. In addition, the company proposed that each side, company and guild, would be allowed to protect no more than two employees from being laid off. After the last day of the contract we are bargaining now, or after all employees have received their second full performance appraisals corresponding with their anniversary dates, whichever is later, layoffs shall be based on seniority, work record, the employee’s qualifications and ability to do the remaining work. GUILD: Prior to the completion of the second full performance appraisal, the current layoff language considering seniority will be used except in the case of reporters who would use seniority by job title within a department. Departments are defined as Metro/Business, Sports and Features. — Two points for every year of service within a job title, up to a maximum of 50 points. — Up to 50 points for an employee’s performance appraisal. If an employee has not had a performance appraisal within six months prior to the notice of a layoff, the most recent appraisal may be revisited and updated. If two or more employees have the same total points, seniority with the company will be the tie breaker. COMPANY: Prior to the completion of the second full performance appraisal, our current layoff language will apply by job title by department. Departments are Metro, Business, Sports, Features and Editorial Page. In addition, each party can protect one employee in a department. — One point for every year of service within a job title, up to a maximum of 20 points. — Up to 80 points for the performance appraisal. If an employee has not had a performance appraisal within six months prior to the notice of a layoff, the most recent performance appraisal may be updated. If two or more employees subject to the layoff have the same total points, company seniority shall be the tie breaker. COMPANY: Change the language of our current contract to focus the provision solely on equipment (removing the term “processes”) and shorten the time periods to implement changes after the Guild has been notified of equipment changes. Current language is six months’ notice, if possible, but no less than three months’ notice. Company’s proposed time frame is three months, if possible, but no less than one months’ notice. GUILD: Keep the current language intact, except agree to the company’s proposed time frame for notice. COMPANY: The company agreed to the Guild’s counter proposal. The Guild had proposed bringing Viva Colorado employees currently working on the same floor as The Denver Post newsroom under the scope of the newsroom contract. COMPANY: The company maintained this issue was outside the scope of the newsroom contract asserting that Viva Colorado employees are covered by the non-newsroom Guild unit. GUILD: The bargaining committee agreed to the company’s assertion. It should be noted that although the editorial portions of Viva Colorado are produced on the same floor as The Denver Post newsroom, they are working for the advertising department. Any work done by Denver Post newsroom employees for Viva must be approved by Post management and appropriately charged to Viva Colorado. COMPANY: The company noted a tentative agreement. COMPANY: Keeping the employees’ premium share for health insurance the same — 30 percent. The current contract states funeral leave must be taken within seven days of a death. We had discussed the possibility of allowing employees to schedule bereavement leave farther out than a week and arrived at a tentative agreement in early May. COMPANY: The key clause in the company’s proposal states: In order to be eligible to take such leave the employee must notify his/her supervisor within 5 business days of the death and schedule the date the leave will begin. GUILD: The committee agreed with the company’s proposed language with the addition of adding that employees will work with their supervisor to schedule time off. COMPANY: The company agreed to the Guild’s proposed addition. COMPANY: If the bargaining committees reach agreement on all company and guild issues, all newsroom employees shall be required to join the Guild. GUILD: The Guild bargaining committee agreed to the company’s proposal. COMPANY: An 18-month contract term. — 2 percent increase to take effect Jan. 1, 2013. — 2 percent increase to take effect Jan. 1, 2014. — 3 percent increase to take effect Jan. 1, 2015. This 7 percent total increase corresponds to the change in the Consumer Price Index from 2008 to 2011. This means our wages in 2015 would be keeping pace with inflation for the past three years, albeit three years behind. COMPANY: Freeze wages at their current levels. GUILD: $75 reimbursement of cell phone and data plans for employees required to have a cell phone. COMPANY: Reimbursement of up to $50 for employees required to have a cell phone. Additional data plan reimbursement may be approved on a case-by-case basis. GUILD: Employees working more than one hour in any eight-hour shift in a higher wage classification shall be paid eight hours at the higher classification. Our current contract states the employee must work four or more hours in the higher classification to be paid eight hours at the higher rate. If an employee works in a higher wage classification 30 percent of the time during a three month period, the employee will advance to the higher classification. COMPANY: Same as current contract. We are scheduled to meet again on July 24. Because of the Century Aurora 16 shootings, the July 24 bargaining session was cancelled. We have not yet scheduled another date. We are scheduled to meet again on August 21.